Note: Carl Riff has extracted various events that were reported in various media. Items marked * are from various sources. Items marked ** were published in the St. Thomas Times Journal and the date shown is the date published and may or may not be the actual date of the event. 1925 - Niagara Branch passenger service discontinued. February 12, 1925 - Replacement bridge for Cantilever bridge at Niagara Falls opened for traffic. September 1930 - Telegraph line in St. Thomas buried underground. July 5, 1932 - Governor Franklin D. Roosevelt glided through St Thomas early yesterday morning on the CASO. This was following his historic triumphal acceptance speech for the nomination for President at the Democratic Convention in Chicago. He had left Chicago the night before and boarded The Exposition Flyer. It was sunrise in St Thomas, Ontario when the train pulled into the station. The train left St Thomas and arrived at Buffalo at 9:52 and with journalists waiting he began the campaign for President. 1934 - Leamington & Amherstburg branch passenger service discontinued. 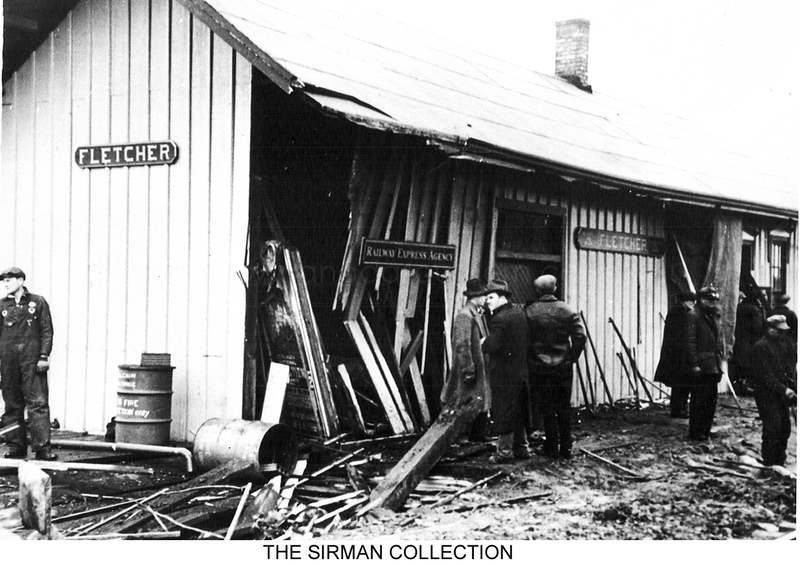 June 18, 1935 - Canada Southern shops temporarily shut down. March 20, 1936 - The Pennsylvania Railroad's famous "Red Arrow" is using the Michigan Central's Canada Division. The "Red Arrow" crack passenger flyer of the Pennsylvania Railroad is enjoying a few trips over the C. S. Division of the MCRR as a result of flood conditions in the vicinity of Pittsburgh, Johnstown and other Pennsylvania State points It came through St Thomas as a section of the Wolverine. It attracted some attention. June 19, 1936 - MCRR train No. 44 carried an unusual car. A large fish car from John G. Sheld Aquarium of Chicago en route to Massachusetts for loading. May 20, 1941 - Niagara Branch from Chippawa to Niagara Jct. abandoned. 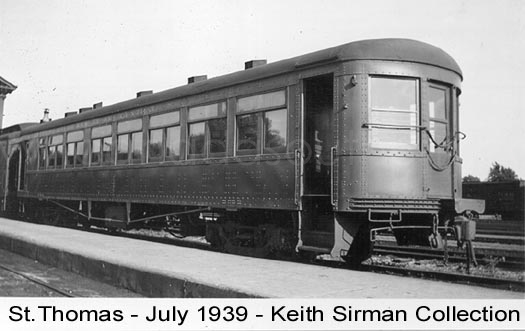 December 9, 1941 - Four stainless steel coaches are being operated daily on the Empire State Express through St Thomas. Trains No 50 and 51 carry about seven other coaches. Three of the streamlined cars that came through St Thomas were named the "Charles Hughes", the"DeWitt Clinton", and the "Charles Whittman." The fourth car was a dining car that was not named but did have a special number. January 26, 1945 - Train stuck in snow drift east of Alvinston. March 1, 1945 - One of the latest of the big Hudson Type NYC locomotives to come out of the shops is NYC 5365. It made some test runs to Springfield, Ontario alone and was put into freight service prior to resumption of passenger service. March 13, 1945 - Protest against closing of the St. Clair branch. June 1948 - Railway Post Office service removed. July 22, 1948 - A strange case of consecutive numbers on doubleheaders over the NYC 5366 and 5367, NYC 5360 and 5370 on the Empire State Express. 1953 - Windsor roundhouse closed. June 1953 - ventilation project of Windsor/Detroit tunnel commenced. 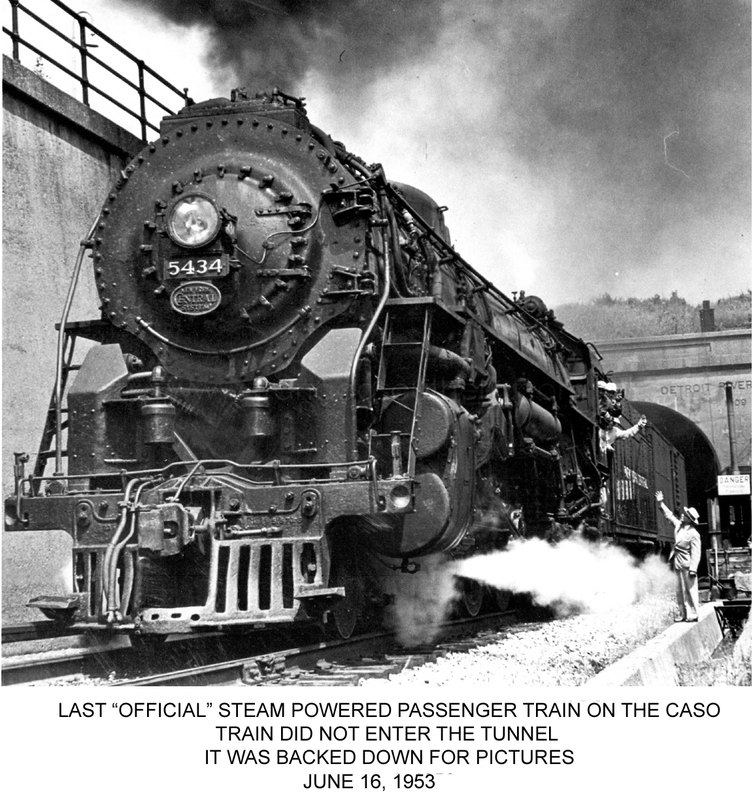 June 16, 1953 - Last 'official' steam powered passenger train on the CASO with locomotive 5434. Due to diesel failures and power shortages - steam still pulled a few passenger trains after this date - 88 in 1954, 3 in 1955 and just 1 in 1956. December 29, 1953 - End of Detroit River Tunnel electric service. 1956 - First batch of diesels delivered - purchased second hand from Chesapeake & Ohio. 1957 - Second batch of diesels delivered - new from GMDD and all remaining steam retired by the end of April 1957. 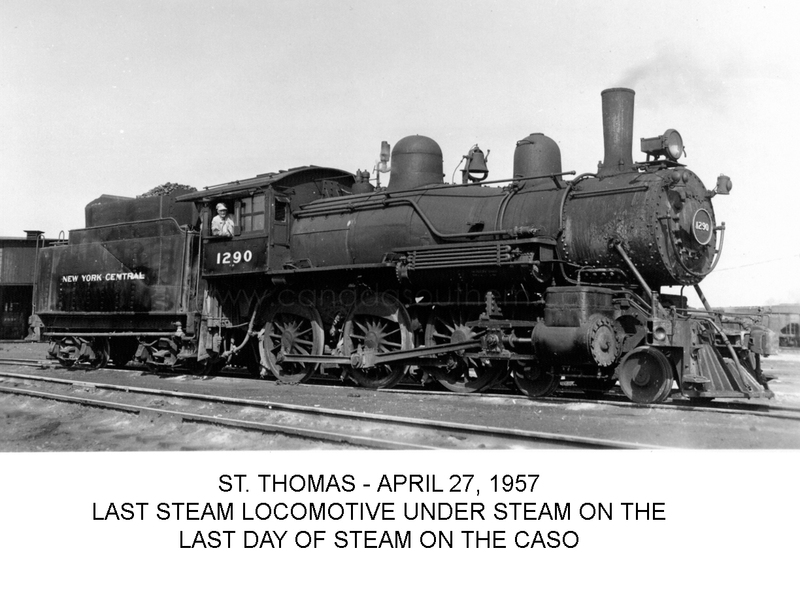 Last steam run - #1290 on April 27, 1957. April 30, 1960 - St. Clair Branch abandoned. Details of last trip. October 1960 - St. Clair Branch bridges offered for sale. December 1962 - St. Clair branch right of way sold for possible gas pipeline. May 1963 - Oil Springs station at the Oil Museum. June 1964 - NYC denies CASO abandonment rumours. June 1967 - Wooden River St. bridge over abandoned rail line in Alvinston removed. February 1973 - Welland 'Townline" Tunnel opened for service. April 1, 1976 - Conrail formed to take over Penn Central. April 1976 - Amtrak to provide local passenger service. June 1976 - Effort to claim missing Canada Southern assets. 1978 - St. Thomas roundhouse demolished. January 31, 1979 - Last through passenger train operated - Amtrak Niagara Rainbow. May 1, 1985 - CN & CP takeover. June 1, 1985 - Chessie moves trains operating between Windsor and St.Thomas to CASO rails. March 1996 - CSX moves trains off CASO to CN rails. December 19, 2001 - Mainline in downtown Niagara Falls removed. 2003 - Mainline between Attercliffe and St. Thomas removed. 2005 - Most of remaining trackage in St. Thomas yard removed ( except some tracks left for the Elgin County Railway Museum ). 2006 - Mainline between St. Thomas and Fargo removed. 2009 - MCRR shop building and some yard trackage at St. Thomas sold to Elgin County Railway Museum. 2012 - November-December - Mainline between Fargo and Windsor removed.